Dental Implant Specialists. We are a low volume, high quality practice and we take meticulous care to produce the best results for people. A purpose built facility with an elegant, reassuring setting with state of the art equipment. Nelson Oral Surgery is run by husband and wife team Jo Young and Iain Wilson. Iain is a NZ trained oral and maxillofacial surgeon who has worked extensively overseas and returned to NZ in 2000 to set up Nelson Oral Surgery. He is a registered medical and a registered dental specialist. 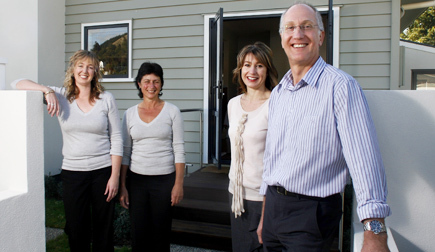 Jo is a NZ trained dentist who has a particular interest and is very experienced in restoring dental implants. Find out about our Business Profile from the WildTomato magazine. Please call our office on 03 548 0838 for more information or to make an appointment. With improving dental care the erupting wisdom teeth are increasingly impacted causing discomfort and infections. We take great care in the removal of wisdom teeth. We offer a comprehensive dental implant service where we will give you all your options and you choose the solution best for you. We replace single teeth to full arch dental reconstruction to restore your smile, improve your bite or even secure your dentures. ACC approved for implant replacement of teeth lost in accidents. We are happy to co-ordinate implant treatment with your own dentist who can restore the implants we place.